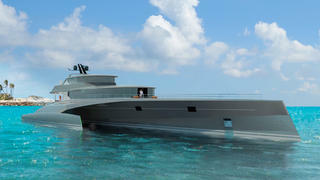 Multihull specialist Blue Coast Yachts has revealed details of its latest project — a 60 metre trimaran that will be built in Latvia. The French yard added that construction will begin in September at the Latitude Yachts facility in Riga, with a planned 2018 launch date. Designed by Coste Design and Gilles Vaton, the BCY 60m is an extended version of the twin 53 metre trimaran superyachts Galaxy and Galaxy of Happiness, which were launched last month. The layout includes accommodation for 12 guests and a crew of eight, with a main-deck master cabin and five guest cabins in the central hull. The main saloon includes areas for entertaining and relaxing as well as a formal dining area with grand views through large windows. The upper deck comprises a raised pilothouse and an upper saloon, while back aft there is room for a glass-sided pool surrounded by sunpads. Further lounging space is available on the foredeck. Blue Coast Yachts adds that the 60m will come with “enormous scope for customisation”, with a choice of six hull colours and two transom configurations. The hybrid propulsion system will feature a pair of 2,600hp diesel engines and one electric engine in each of the outriggers. This results in a maximum speed in excess of 30 knots, as well as an all-electric mode that allows silent cruising at up to 8 knots. Meanwhile, the BCY 60m’s 20,000 litre fuel tank and super-efficient wave-piercing hulls should deliver an estimated cruising range of 2,800 nautical miles. Naval architecture is by Coste Design, while the main build materials will be GRP and carbon fibre for a total displacement of around 200 tonnes.